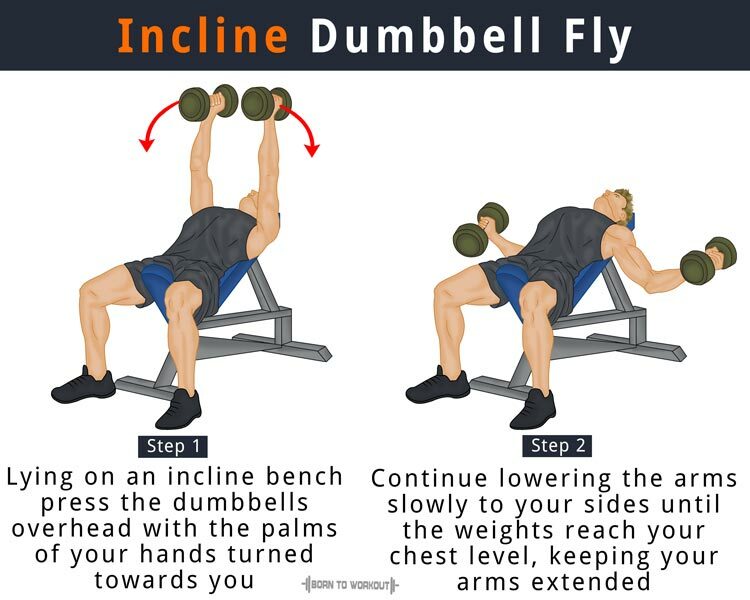 The different variations of dumbbell flys target the front, middle, and posterior regions of your deltoids. Therefore, these exercises strengthen your shoulders and help improve your ability to lift heavy objects in everyday life. 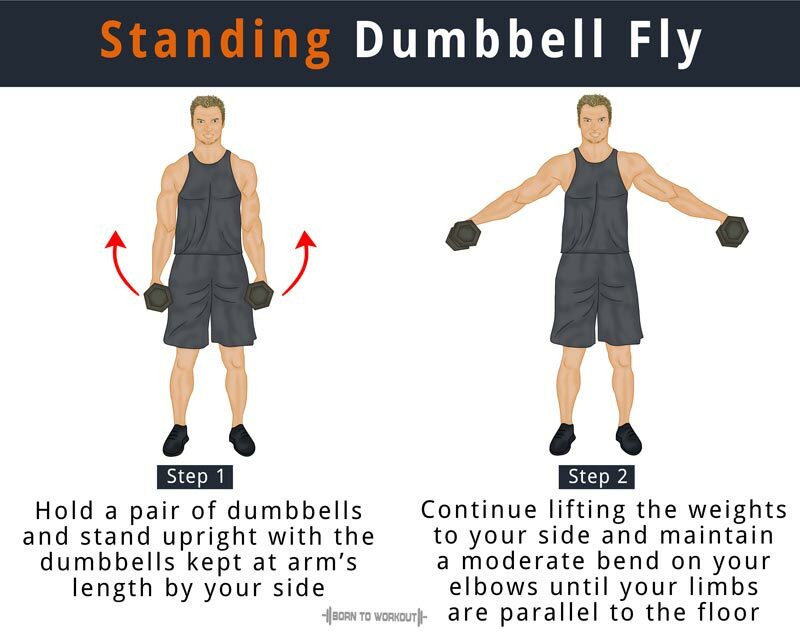 Performing the dumbbell flys is beneficial to not just the bodybuilders but also for those associated with sports that involve shoulder movements, swinging, and throwing, such as tennis players, swimmers, and footballers. Since your arms act as levers when performing these exercises, you need to move significantly lesser amount of weight than some of the chest and shoulder presses like the bench press and military press. Holding a pair of dumbbells stand upright with the dumbbells kept at arm’s length by your side. Make sure the palms of your hands are facing you. It is your initial position. Keep your torso still so that there is no swinging movement. Lift the weights to your side and maintain a moderate bend on your elbows and a little forward tilt in your hands. As you breathe out, continue lifting the dumbbells up until your limbs are parallel to the ground. Pausing a second at the top of the movement, bring the weights back to your initial position as you breathe in. Repeat the above steps for the required amount of reps. Grabbing a pair of dumbbells in each hand, lie on a bench set to an inclination of 30 degrees. Press the dumbbells above you, keeping a slight bend at your elbows with the palms of your hands turned towards you. It is your starting position. As you inhale, continue lowering the arms slowly to your sides until the weights reach your chest level, keeping your arms extended and maintaining the bend at your elbows. As you exhale, reverse the movement and press the dumbbells up to your initial position. Perform the required amount of reps until you complete the set. Pick a pair of dumbbells and move to an open area. Bend at your hips until the body is parallel to the ground. Allow your arms to hang down freely from your shoulders, holding the dumbbells using as neutral grip. It is your initial position. Pull the weights towards the ceiling with the help of your rear deltoid muscles. 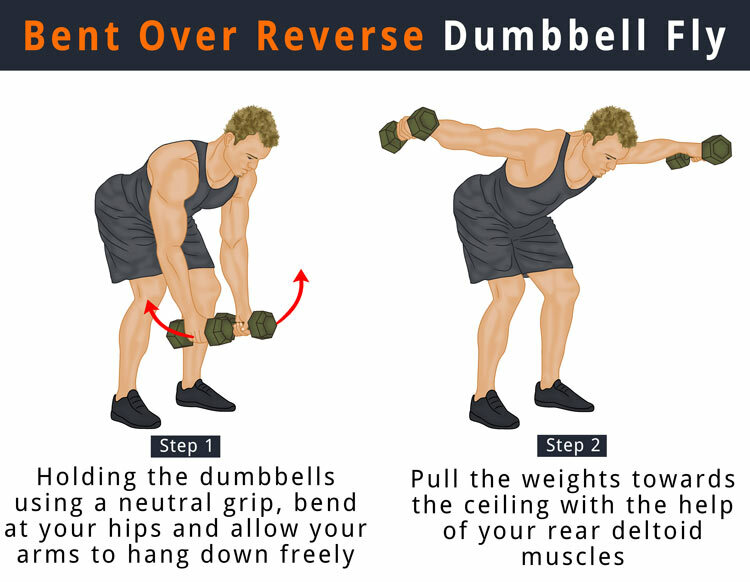 Lower the dumbbells under control to return to your original position. Do the recommended number of repetitions. The movement should happen at your shoulder joint and the wrist while keeping the elbows stationary. Avoid touching the dumbbells at the top to keep tension on the targeted muscle groups. Maintain tension in the abs but do not let your back to arch excessively.